Or at least, that is true in the case of two Minnesota beer deliverymen who successfully prevented a suicidal man from ending his life by jumping off an interstate bridge in St. Paul by offering the desperate soul a Coors Light. The authorities have identified the two gallant deliverymen as Jason Gable and Kwame Anderson. The pair was driving their truck on Wednesday morning when they saw the man clinging to the outer fence of the bridge. They cared enough to stop and ask the man if he was okay. Just like in the movie, Anderson along with his partner-in-good-deed Gable tried to build a rapport with the man before offering to have a talk with him over a beer. The pair encouraged the disturbed man to share with them whatever it is that’s bothering him, enough for him to want to take his own life. The pep talk worked as the man then slowly but surely inched his way back to safety, abandoning in the process his earlier despondent plans. Police arrived not long after and closed the interstate until the man came down. The unnamed man was brought to a hospital for check-up. It is likely that the man was no longer able to take up on the pair’s offer for a beer. It’s safe to think, however, that for sure the offer will still stand in case the man is well enough to “collect” the favor the Good Samaritans promised him. 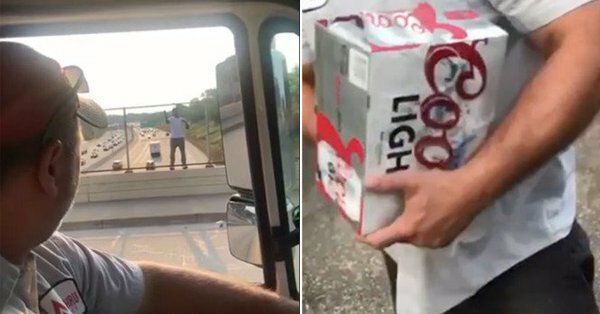 Hopefully, too, the pair’s employers will not mind giving up a box of beer or two to the man their delivery men bravely saved, in part from the sweet promise of free booze. Many expressed amusement with the feel-good story, and they also expressed approval for the pair’s good deed. Cheers indeed! Thankfully the men took the time to stop! We will never how we can change the world with one act of kindness. Reminds me, what is better then beer? Those men deserve recognition, a medal, a raise and more free beer! Cheers!